The absence of tumor necrosis factor (TNF) causes lethal infection by Leishmania major in normally resistant C57BL/6J (B6.WT) mice. The underlying pathogenic mechanism of this fatal disease has so far remained elusive. We found that B6.WT mice deficient for the tnf gene (B6.TNF-/-) displayed not only a non-healing cutaneous lesion but also a serious infection of the liver upon L. major inoculation. Infected B6.TNF-/- mice developed an enlarged liver that showed increased inflammation. Furthermore, we detected an accumulating monocyte-derived macrophage population (CD45+F4/80+CD11bhiLy6Clow) that displayed a M2 macrophage phenotype with high expression of CD206, arginase-1, and IL-6, supporting the notion that IL-6 could be involved in M2 differentiation. In in vitro experiments, we demonstrated that IL-6 upregulated M-CSF receptor expression and skewed monocyte differentiation from dendritic cells to macrophages. This was countered by the addition of TNF. 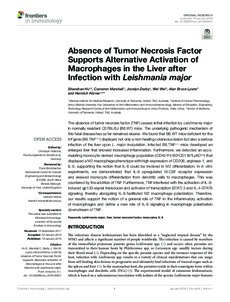 Furthermore, TNF interfered with the activation of IL-6-induced gp130-signal transducer and activator of transcription (STAT) 3 and IL-4-STAT6 signaling, thereby abrogating IL-6-facilitated M2 macrophage polarization. Therefore, our results support the notion of a general role of TNF in the inflammatory activation of macrophages and define a new role of IL-6 signaling in macrophage polarization downstream of TNF.